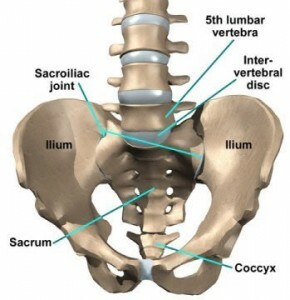 As a yoga practitioner, I’ve experienced some pain, discomfort in my sacroiliac (SI) joints at times. Having a scoliosis (uneven spine and pelvis), I’m at greater risk to feel some sensitivity around this joint. The SI joints have some mobility, a little give, but they are mainly joints of STABILITY. For those of you who don’t have any anatomical knowledge, please stay with me, here are some more information. A joint is where two bones meet. We have two SI joints: one on the right where the ilium (latin name for one side of the pelvis) and the sacrum meet and one one the left. Around every joint, there are some ligaments. We can stretch them a little during our asana practice but if we overstretch them, they don’t go back to their regular length and the joints are becoming hypermobile. Think of a gum being stretched, once lengthened it won’t return to its original length. Don’t get me wrong, I’m not saying that stretching is bad, I’m saying: it MUST be combined with STABILIZATION. 85% of women suffered or are suffering from SI pain compare to 15% of men. How unfair! Here are some reasons. First, a woman’s pelvis is wider than a man’s so there is more torquing action happening just by its nature, the joint is also shallower in a woman’s pelvis hence less stable and finally, (as if it wasn’t enough!) the ligaments around the joints respond to the hormones changes (periods, pregnancy, menopause…). If you are or have been pregnant, you most likely know what I’m talking about. For a pain free SI joints, the well known yoga instructor, Judith Hanson Lasater, who is also a physical therapist, has a strong opinion on the subject: ALWAYS MOVE YOUR PELVIS AND YOUR SACRUM TOGETHER especially in twists and forward bends. In other words, she encourages to let the pelvis turn with the spine in a twisting asana instead of keeping it leveled. It does makes sense to me and my body for it creates the stability my SI joints are lacking. That being said, it may not work for you. I’d be happy to read your comments and feedback. At the end of the day, I do believe an asana practice is an extremely personal and individual one depending on our structure, musculature, gender, age… What works for me may not work for you and vice versa. Next time we are on our mat, let’s deeply tune in and listen to the signals our body is sending. Yoga is the art of paying attention.